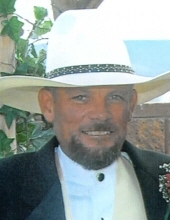 Fremont, Utah - Our kind and beloved father, grandfather, brother, uncle, and friend Ricky Russell Taylor age 54 of Fremont passed away on February 4, 2019 in Gunnison, Utah. Ricky was born on September 2, 1964, a son of Ted Russell and Sharlene Brian Taylor. He attended Wayne High School where he graduated with the Class of 1983. He married Joan Woolsey September 7, 1985 in Bicknell. They later divorced. He later met the love of his life Lora Griffiths. Ricky was a member of the Church of Jesus Christ of Latter Day Saints. He enjoyed farming and ranching. He liked to herd cows in U.M. and the desert on his beloved horse Charles. He loved to camp, and enjoyed being in the outdoors. Most important to him was his six grandsons whom he adored. He was excited for his first granddaughter due to arrive any day. He is survived by his children: Trista and Kade Nielson of Central Valley; Saige and Trinity Edwards of Loa; Dakota and Katie Taylor of Central Valley; his grandsons: Bryson, Kayson, Kyx, Knox, Zayn, Kreed; the soon to arrive granddaughter; his step-mother Peggy Taylor of Loa; His brothers: Jason and Dana Taylor of Farr West; Justin and Dawna Taylor of Phoenix, Arizona; Jordan and Lisa Crane of St. George. He was preceded in death by both of his parents; a younger brother Jay R. Taylor; his grandparents: Roe and Dela Brian; Evan and Verla Nielson Taylor. Funeral Services will be held 1:00 p.m., Monday, February 11, 2019 in the Fremont LDS Ward Chapel, 24 South 100 West, Fremont, Utah. Friends may call for viewing Sunday evening from 6:00 p.m. to 8:00 p.m. at the Springer Turner Funeral Home, 260 North 400 West in Richfield, or from 11:00 a.m. to 12:30 p.m. at the ward chapel prior to services. Burial will be in the Fremont Cemetery under the care of the Springer Turner Funeral Home of Richfield and Salina, Utah. To send flowers or a remembrance gift to the family of Ricky Taylor, please visit our Tribute Store. "Email Address" would like to share the life celebration of Ricky Taylor. Click on the "link" to go to share a favorite memory or leave a condolence message for the family.